Rojas-Agramonte Y., Garcia-Casco A., Kaus B.J.P., Kröner A., Williams I.S., Gerdes A., Toulkeridis T., Baumann T., Wong J., Xie H., Buhre S., Rodriguez-Ruiz M. (2019) Large-scale sediment recycling in the asthenospheric mantle below Galápagos. Wang X., Kaus B.J.P., Zhao L., Yang J., Li Y. (2018). Mountain building in Taiwan: insights from 3-D geodynamic models. Journal of Geophysical Research - Solid Earth. Howell S.M., Olive J.-A., Ito G., Behn M., Escartin J., Kaus B.J.P. (2018). Seafloor expression of oceanic detachment faulting reflects gradients in mid-ocean ridge magma supply. Earth and Planetary Science Letters. Martinez-Montesinos B. Kaus B.J.P., Popov A.A. (2018). Simulating fluid injection in geological media with complex rheologies. Extended abstract for the GEOHEAT 2018 conference. Pouryazdan M., Kaus B.J.P., Rack A., Ershov A., Hahn H. (2017). Mixing instabilities during shearing of metals. Nature Communications. Vol 8(1), 1611, doi:10.1038/s41467-017-01879-5. Baumann T.S., Kaus B.J.P., Eichheimer P. (2017). 3D Numerical Modelling of Salt Tectonics. 79th EAGE Conference and Exhibition 2017, doi:10.3997/2214-4609.201701173. Castro J.M., Cordonnier B., Ian Schipper C., Tuffen H., Baumann T.S., Feisel Y. (2016). Rapid laccolith intrusion driven by explosive volcanic eruption. Nature Communications. 13585, doi: 10.1038/ncomms13585. Kaus, B.J.P. (2016) Constraining lithospheric flow. Science. Vol 353, Issue 6307, Sep. 30, 2016. doi:10.1126/science.aai8442. Püsök A., Kaus B.J.P., Popov A.A. (2016). On the quality of velocity interpolation schemes for marker-in-cell method and staggered grids. Pure and Applied Geophysics. doi: 10.1007/s00024-016-1431-8. Kaus B.J.P., Popov A.A., Baumann T.S., Püsök A.E., Bauville A., Fernandez N., Collignon M (2016) Forward and inverse modelling of lithospheric deformation on geological timescales. NIC Symposium 2016 - Proceedings. NIC Series. Vol. 48. edited by K. Binder, M. Müller, A. Schnurpfeil, p. 299-307. [Reprint]. Marques F., Kaus B.J.P., (2016) Speculations on the impact of catastrophic subduction initiation on the Earth system. Journal of Geodynamics. Vol. 93, p. 1-16. doi:10.1016/j.jog.2015.09.003 [Reprint]. Thielmann M., Kaus B.J.P., Popov A. (2015) Lithospheric stresses in Rayleigh-Bénard convection: Effects of a free surface and a viscoelastic Maxwell rheology. Geophysical Journal International. Vol. 203 (3), p. 2200-2219. doi: 10.1093/gji/ggv436. Fernandez N., Kaus B.J.P. (2015) Pattern formation in 3-D numerical models of down-build diapirs initiated by a Rayleigh-Taylor instability. Geophysical Journal International. Vol. 202, No. 2, p. 1253-1270, DOI: 10.1093/gji/ggv219. Fernandez N., Kaus B.J.P. (2014) Influence of pre-existing salt diapirs on 3D folding patterns. Tectonophysics. Vol. 637, p.354-369. doi:10.1016/j.tecto.2014.10.021. Hundermark-Zauskova A., Lehmann R., Hess M., Müller F. (2013) Numerical simulation of glottal flow. Computers in Biology and Medicine. Vol 43(12). pp. 2177-2185. doi:10.1016/j.compbiomed.2013.09.009. Crameri F., Schmeling H., Golabek G.J., Duretz T., Orendt R., Buiter S., May D.A., Kaus B.J.P., Gerya T.V., Tackley P.J. (2012). 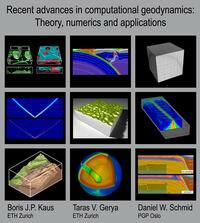 A benchmark comparison of numerical surface topography calculations in geodynamic modelling. Geophysical Journal International. Vol. 181 (1), p.38-54. Lu G., Kaus B.J.P., Zhao L. (2011). Thermal localization as a potential mechanism to rift cratons. Physics of the Earth and Planetary Interiors. Vol. 186, p. 125-137. Duretz T.M., Kaus B.J.P., Schulmann K., Gapais D., Kermarrec J.-J. (2011). Indentation as an extrusion mechanism of lower crustal rocks in the Eastern Bohemian Massif: Insight from analogue and numerical modelling. Lithos. Vol. 124 (1-2), 158-168. Castelltort S., Nagel S., Mouthereau F., Lin A.T.-S., Wetzel A., Kaus B.J.P., Willett S., Chiang S.-P., Chiu W.-Y. (2011). Sedimentology of Early Pliocene Sandstones in the south-western Taiwan foreland: implications for basin physiography in the early stages of collision. Journal of Asian Earth Sciences. Vol. 40, p. 52-71. Deubelbeiss Y., Kaus B.J.P., Connolly J.A.D., Caricchi L. (2011). Potential causes for the non-Newtonian rheology of crystal-bearing magmas. Geochemistry Geophysics Geosystems. Vol. 12, Q05007, 22pp., doi:10.1029/2010GC003485. Movies of some simulations presented in this work: [movie 1] [movie 2]. Kaus B.J.P, Mühlhaus H., May D.A. (2010). 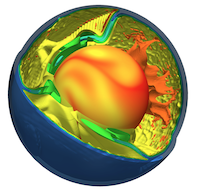 A stabilization algorithm for geodynamic numerical simulations with a free surface. Physics of the Earth and Planetary Interiors. Vol. 181, p. 12-20. Kaus B.J.P. (2010). Factors that control the angle of shear bands in geodynamic numerical models of brittle deformation. Tectonophysics. Vol. 484 (1-4), p. 36-4. Deubelbeiss Y., Kaus B.J.P., Connolly J.A.D. (2010). 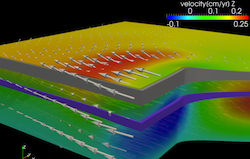 Direct numerical simulation of two-phase flow: Effective rheology and flow patterns of particle suspensions. Earth and Planetary Science Letters. Vol. 290 (1-2), p. 1-12. Bock M., Regenauer-Lieb K., Lotze M., Wilke T., Rücker C. (2010). 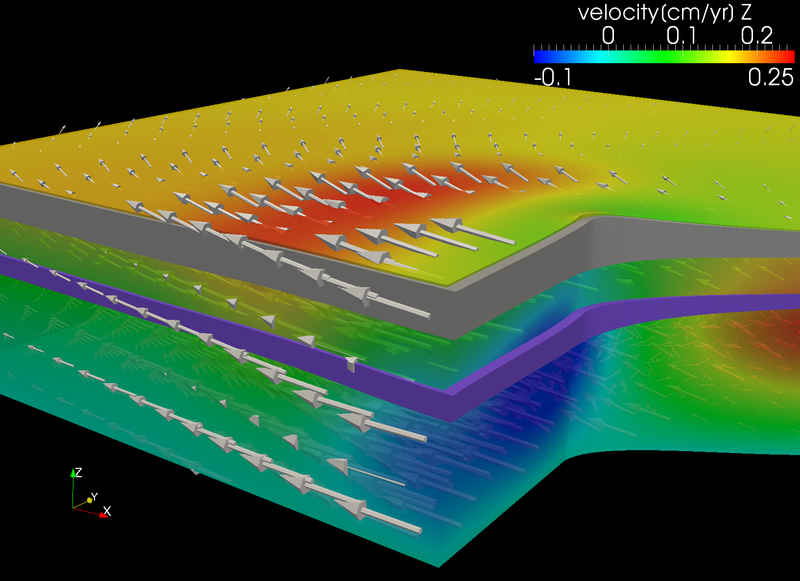 Analysis of thermally induced flows in the laboratory by geoelectrical 3-D tomography. Journal of Geophysical Research, 115, B12410, doi:10.1029/2010JB007462. Schmalholz S.M., Kaus B.J.P., Burg J.-P. (2009). Stress - strength relationship in the lithosphere during continental collision. Geology. Vol 37 (9). p. 775-778. Kaus B.J.P., Liu Y., Becker T.W., Yuen D.A., Shi Y. (2009). Lithospheric stress-states predicted from long-term tectonic models: influence of rheology and possible application to Taiwan. Journal of Asian Earth Sciences. Vol. 36 (1), p.119-134. Kaus B.J.P., Gerya T.V., Schmid D.W. (2008). Recent advances in Computational Geodynamics: Theory, Numerics and Applications. Physics of the Earth and Planetary Interiors. Vol. 171 (1-4). p. 2-6. Deubelbeiss Y., Kaus B.J.P. (2008). Comparison of Eulerian and Lagrangian numerical techniques for the Stokes equations in the presence of strongly varying viscosity. Physics of the Earth and Planetary Interiors. Vol. 171 (1-4). p. 92-111. Schmeling H., Babeyko A., Enns A., Faccenna C., Funiciello F., Gerya T., Golabek G., Grigull S., Kaus B.J.P., Morra G., Schmalholz S., van Hunen J. (2008). A benchmark comparison of spontaneous subduction models – towards a free surface. Physics of the Earth and Planetary Interiors. Vol. 171 (1-4). p. 198-223. Kaus B.J.P., Steedman C., Becker T.W. (2008). From passive continental margin to mountain belt: insights from analytical and numerical models and application to Taiwan. Physics of the Earth and Planetary Interiors. Vol. 171 (1-4). p. 235-251. Platt J.P., Kaus B.J.P., Becker T.W. (2008). The San Andreas transform system and the tectonics of California: An alternative approach. Earth and Planetary Science Letters. Vol. 274. p380-391. Buiter S.J.H., Babeyko A.Y., Ellis S., Gerya T.V., Kaus B.J.P., Kellner A., Schreurs G., Yamada Y. (2006). The numerical sandbox: Comparison of model results for a shortening and an extension experiment. in: Buiter, S.J.H. & Schreurs, G. Analogue and Numerical Modelling of Crustal-Scale Processes. Geological Society of London Special Publications, 253, 29-64. Kaus B.J.P., Connolly J.A.D, Podladchikov Y.Y., Schmalholz S.M. (2005). The effect of mineral phase transitions on sedimentary basin subsidence and uplift. Earth and Planetary Science Letters. 233. p213-228. Miller S.A., Collettinni C., Chiaraluce L., Cocco M., Barchi M., Kaus B.J.P. (2004). Aftershocks driven by a high presssure CO2 source ar depth. Nature. 427. p724-727. Burg J-P., Kaus B.J.P., Podladchikov Y.Y. (2004). Dome structures in collision orogens. Mechanical investigation of the gravity/compression interplay, in: Whitney D.L., Teyssier C. and Siddoway C.S., Gneiss domes in orogeny: Boulder, Colorado, Geological Society of America Special Paper 380, p47-66. [Reprint]. Kaus B.J.P. (2005). Modelling approaches to geodynamic processes. PhD-thesis. ETH-Zurich, Switzerland. pdf Colorpages only. (awarded with the ETH Medal). Kaus B.J.P. (2000). Forward and reverse modelling of the three-dimensional Rayleigh-Taylor instability. Master-thesis. ETH-Zurich, Switzerland. 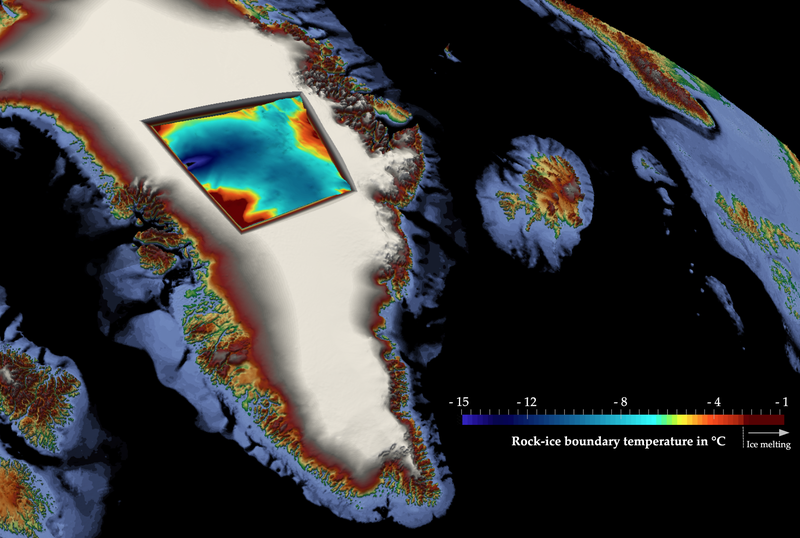 How does the solid Earth interact with glaciers? Have a look at the image created by Tobias and read about it in [Kaus, 2013]. From lithospheric-scale shear localization to subduction. Click on the image to see a movie [Thielmann & Kaus, 2012]. Why is subduction on Earth asymmetric? Click on the image to see a movie [Crameri et al. 2012]. 3D multilayer models of continental collision [Lechmann et al. 2011]. 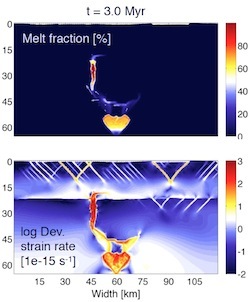 Numerical modelling of the effective rheology of melt and crystals [Deubelbeiss et al. 2011]. Click to see movies.